The definition of reading readiness is the point at which a child goes from not reading, to reading. The process of learning to read is a milestone in a child’s development. It is as if a light bulb goes off and your child will naturally start acquiring the skills and ability to be able to read. 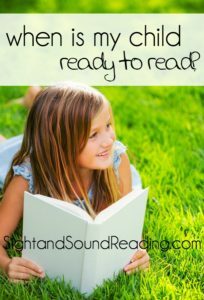 I am going to try and walk you through how you can tell if your child is ready to read, and also give you a free reading readiness test. Once your child is ready to read, we hope you begin our learn to read free program. Able to repeat a sentence. Able to use a scissors and cut. Able to retell a story. Able to write his name. Follows Text from left to right. You can find concrete examples of these reading readiness skills in our free reading readiness test. 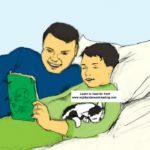 How can I tell if my child is ready to read? Test your child using our free reading readiness test. This reading readiness assessment will serve as a baseline on what your child knows and what your child should works on. All of the skills contained on this reading readiness test are age appropriate knowledge that is necessary in educating your “total” child. Any child that is developmentally ready to learn to read should be capable of these readiness skills. Do not say “Yes, my child knows these skills,” use the reading readiness test and know for sure what your child does and does not know. A child does not have to get all of these responses correct in order to be able to learn to read. 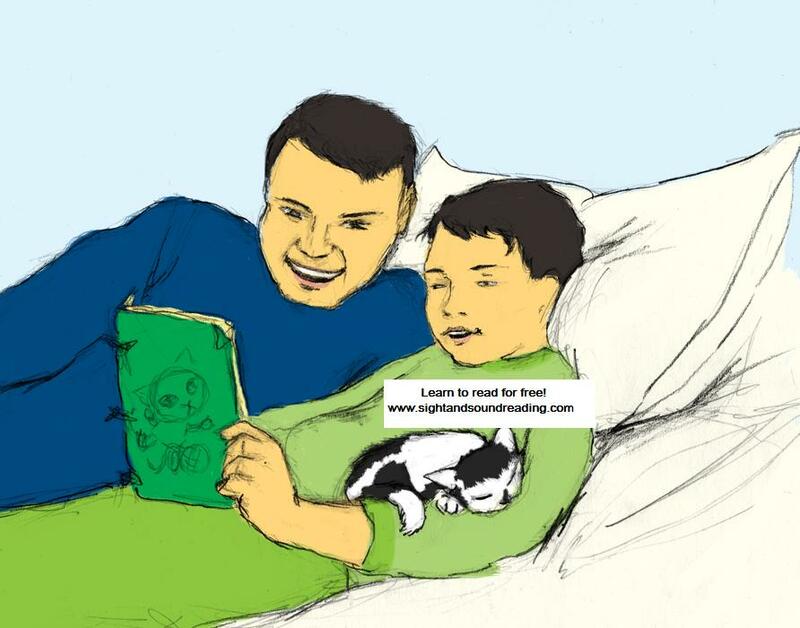 This test serves as a baseline and will help you guide your child as he/she learns to read. If you see your child lacks certain reading readiness skills, you will be able to work with your child more on this skill to help him improve. Click here for your free reading readiness test. 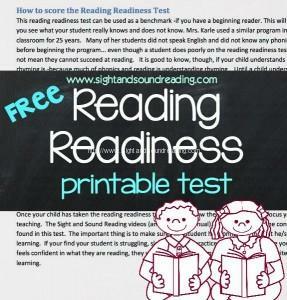 This reading readiness test can be used as a benchmark -if you have a beginning reader. This will help you see what your student really knows and does not know. Mrs. Karle used a similar program in her classroom for 25 years. Many of her students did not speak English and did not know any phonics before learning to read. Even though a student does poorly on the reading readiness test does not mean they cannot succeed at reading. It is good to know, though, if your child understands what rhyming is -because much of phonics and reading is understanding rhyming. Until a child understands rhyming -it will be hard for the student to comprehend a word ladder, and using phonics – changing letters to change words. Knowing the letters and sounds will help the students with reading sight words – but, a student can read sight words without knowing letter sounds. Using the Sight and Sound Reading program, the student will learn phonics and letters sounds while learning sight words. Once your child has taken the reading readiness test, you will know the areas in which to focus your teaching. The Sight and Sound Reading videos (and teachers manual) will touch on all of the concepts found in this test. The important thing is to make sure your student has confidence in what he/she is learning. If your find your student is struggling, slow down and practice for a few days. Once your child feels confident in what they are reading, they will be ready to learn more, and they will be excited about learning. Once you have scored the reading readiness assessment, and you have determined which skills your child knows or needs help with, you can begin helping your child with different reading readiness activities in order to help your child get ready to read. All of our reading readiness activities are listed under the “preschool” section of this site. Another important activity to do to get ready to read is to read, read, read to your child. Reading to your child is one of the best things you can do help your child be ready to read. Your child will intuitively learn from watching and listening to you read.